Why not get married on the island of Ischia in the beautiful Bay of Naples? With lovely beaches, fishing villages, spa towns, a verdant landscape and much more, Ischia provides a truly picturesque backdrop to your wedding in Italy. The air in Ischia Porto, the island’s main town, is scented with the fragrance of its abundant lemon trees. Ischia Porto boasts some lovely expanses of golden sand, plus countless shops, boutiques and cafés to wander around. The Spiaggia del Poscatori beach leads on to the next town, Ischia Ponte, which is smaller and quieter than its neighbor. 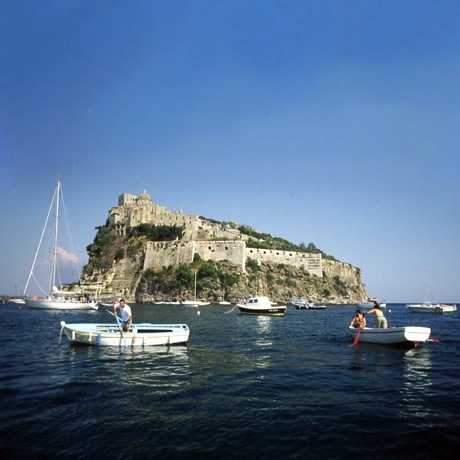 The main attraction of Ischia Ponte is an easily accessible offshore rock, upon which is built the dramatically distinctive Castello Aragonese (Aragonese Castle). The castle is accompanied by a complex of historic buildings, which are fascinating to explore. Close by are two popular coastal spa towns, Casamicciola Terme and Lacco Ameno, both of which have lovely beaches. Lacco Ameno also features two eclectic museums which house pottery, ancient artifacts and a wealth of other interesting items. Built around a pretty bay, Forio is a larger resort town with a historic center, superbly relaxing thermal baths and many top quality restaurants. Between Lacco Ameno and Forio is one of the unmissable attractions of Ischia, the stunning La Mortella gardens, which feature some 300 exotic plants, including the largest water lily in the world. Tiny paths wind their way through the luxuriant foliage, and stopping points include a charming terrace tea room, Thai pavilion and a theatrical museum. The garden’s high points offer breathtaking views. The beautiful fishing village of Sant’Angelo is a notable stopping point on the south side of Ischia, overlooked by a dormant volcano. Sant’Angelo and its surrounding area presents many attractions, including some excellent restaurants, a busy harbor, beaches, hot springs and a steamy outdoor sauna, the Fumarole. Wherever on the island you choose to exchange your vows, you can be assured that your wedding in Ischia will be an unforgettable day. This delightful island is deservedly one of Italy’s most loved destinations.